This is another game where the Radeon VII trails Nvidia’s GPUs by 6 or 7 percent at 4K resolution. That shouldn’t be very noticeable to the human eye, and AMD’s card again has no problems hovering around 60 fps, even with all the eye candy cranked. We’re going to wrap things up with a couple of older games that aren’t really visual barn-burners, but still top the Steam charts day in and day out. These are games that a lot of people play. First up: Grand Theft Auto V ($30 on Humble) with all options turned to Very High, all Advanced Graphics options except extended shadows enabled, and FXAA enabled. GTA V runs on the RAGE engine and has received substantial updates since its initial launch. 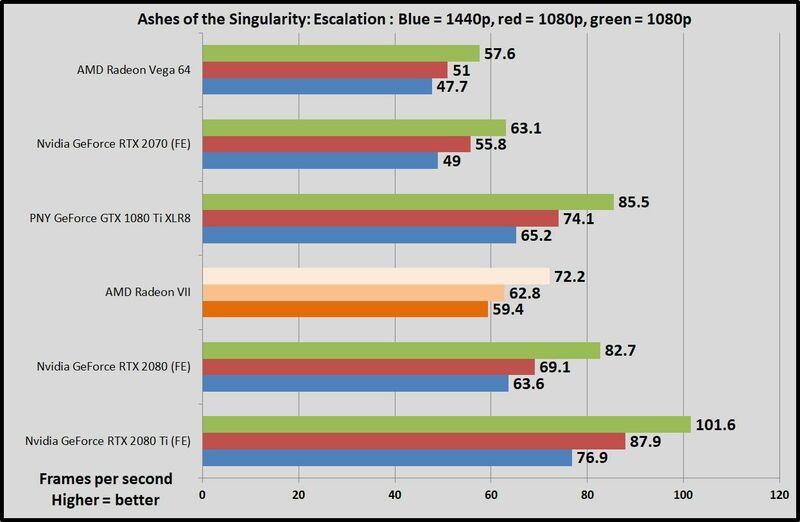 This game tends to vastly prefer Nvidia GPUs, and the Radeon VII trails the older GTX 1080 Ti by a decent amount. 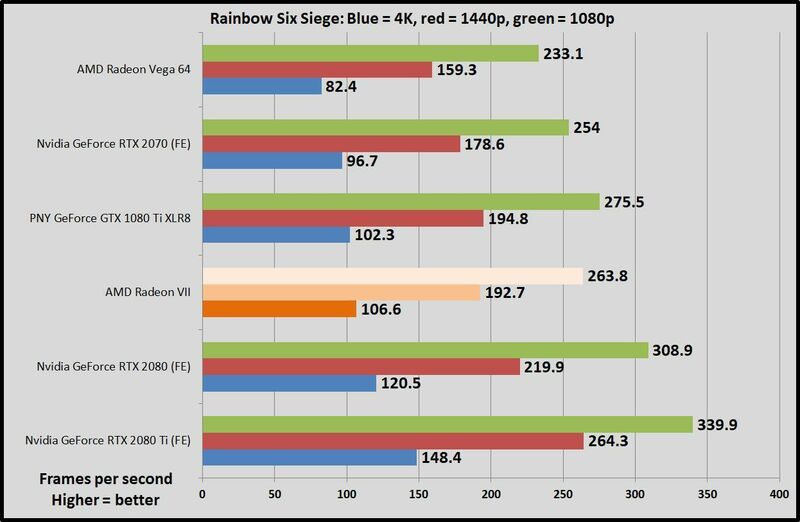 But interestingly, thanks to tweaks in the GeForce RTX 2080’s technological configuration, Radeon VII comes out ahead of it at 4K resolution. Nvidia’s modern option takes back the lead if you shift the resolution down to 1440p or 1080p, though. 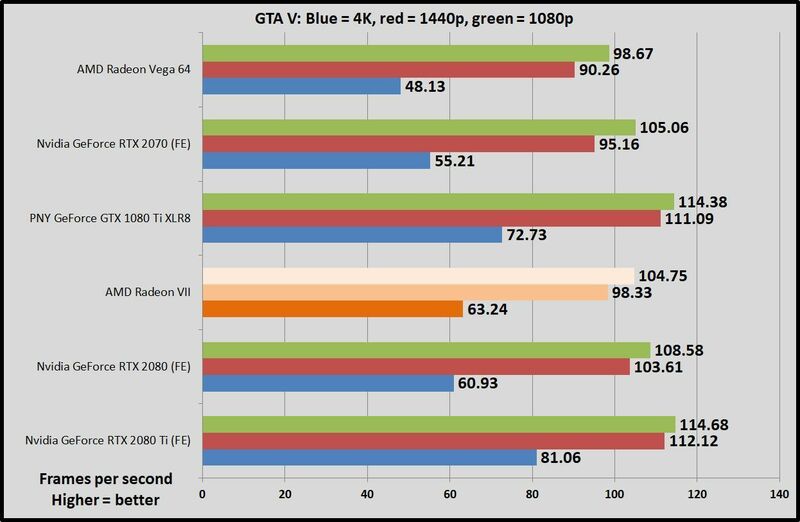 Radeon VII is also 31 percent faster than Vega 64. Finally, let’s take a peek at Rainbow Six Siege ($40 on Humble), a game whose audience just keeps on growing, and one that still feels like the only truly next-gen shooter after all these years. Like Ghost Recon Wildlands, this game runs on Ubisoft’s AnvilNext 2.0 engine, but Rainbow Six Siege responds especially well to graphics cards that lean on async compute features. Nvidia greatly enhanced the async compute capabilities of its graphics architecture in the new RTX 20-series lineup. As a result, the RTX 2080 opens up a huge lead over Radeon VII, even though AMD’s new card performs fairly evenly with the older GTX 1080 Ti. If you’re a Siege fan, you’ll want to opt for RTX over RVII.